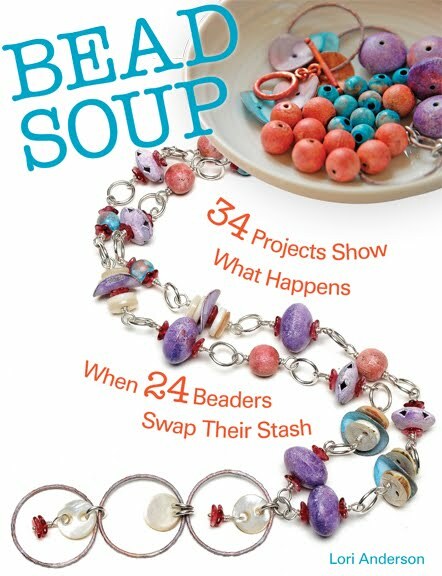 If you aren't familiar with my Cup of Bead Soup or Bead Soup projects, you can click here and here. 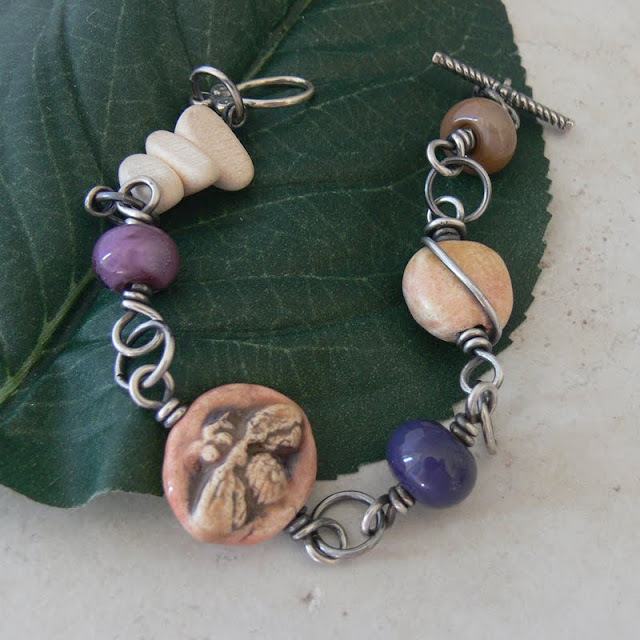 This month the Featured Artist for Cup of Bead Soup is Spirited Earth. I received an absolute cornucopia of ceramic beads and pendants from her, and in between migraines, trips, and trying to help a son deal with full-blown panic attacks due to start of school (nightmares every. single. night), I've relaxed by working with her beauties. One of Spirited Earth's charms-- click here to buy. 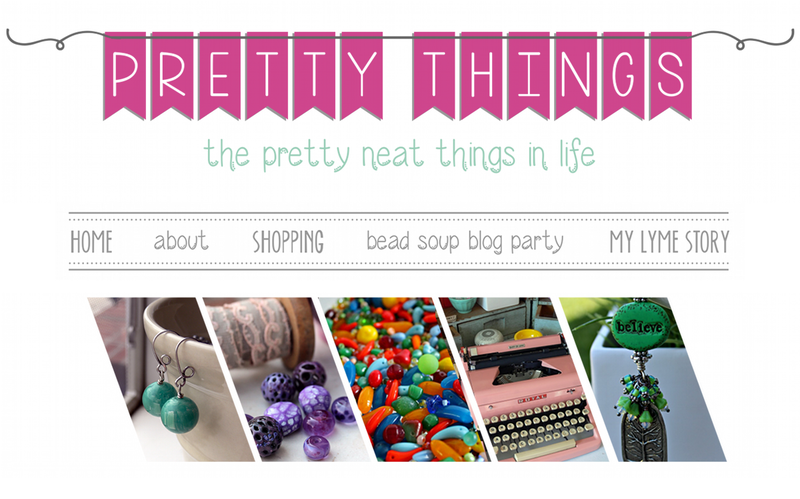 Today I'm revealing two bracelets made with beads she sent. The first is a bracelet made with one of her bee beads and one of her ceramic accent beads. I've been talking quite a lot with Cindy Wimmer of Sweet Bead Studio about wire gauges, and for this bracelet I decided to use 16 gauge wire. I normally use 20 gauge wire in linked bead bracelets because that's the largest gauge that a 4mm Swarovski bead can fit through. This bracelet, however, needed something more substantial. I used my own lampwork beads and some bleached wood for the rest of the bracelet, then oxidized the silver and buffed it. I did put the wood in the liver of sulphur solution but I won't do that again because I had to put the bracelet out in the sun to dry completely. Lesson learned. I wrapped the silver wire around the ceramic accent bead for an interesting but simple touch, and the choice of purple fits well with this fall's Pantone color report. 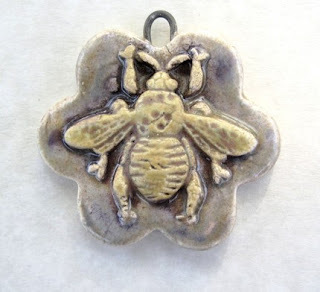 Spirited Earth (as of this writing) has several bee pendants available, including this one, which I think is fabulous. Grab this one now by clicking here!! 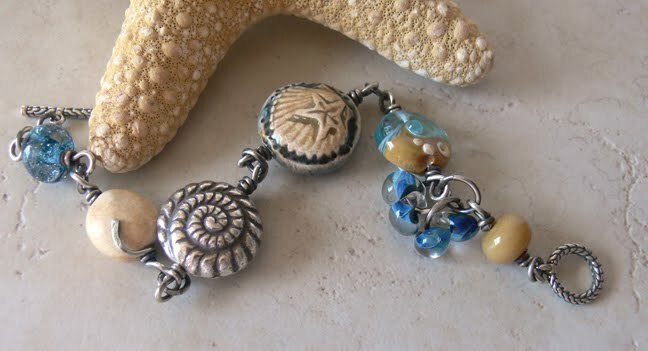 My next bracelet used one of Spirited Earth's nautical-themed beads, an adorable one complete with shell and sea star. Once again, I used 16 gauge wire, oxidized it, and buffed it. I used one of her ceramic beads as an accent and pulled a bit of the heavy-gauge sterling over it as an "oh hey, look at that" accent. I had a Thai silver pendant lying around and used it, and then added some of my own lampwork spacers and one lampwork bead orphan from a previous set that matched up well with Spirited Earth's shell bead. I also have four orphan lampwork clusters that I hooked onto a large jumpring. I thought that was a nice way to break up the monotony of tan between the two lampwork beads. 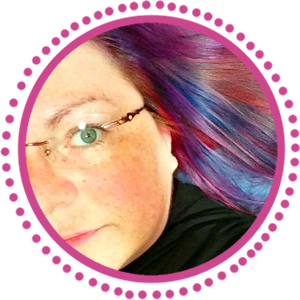 Things I learned -- how to use heavy-gauge wire in my creations. I've never really used 16 gauge wire in this way. I also got over my laziness for pulling out the liver of sulphur and Pro Polishing Pads to do finishing work on pieces. Usually, I'm a bright silver sort of person and oxidation isn't something I do as a norm. And, I found a great use for orphan beads. In my house, no bead goes unloved. Stay tuned for more -- there will be more reveals this week! The bracelets are beautiful. They look very spiritual and calming. The little bee is darling. Thanks to you and your Bead Soup, I've been checking out new things. I just received my things from Spirited Earth yesterday. Love them! My boyfriend agrees. They are amazing! i almost don't recognize my own beads. it's so interesting to see them transformed by anothers creative hand.. Fantastic work!! i love it! The bracelet is great! I especially like the second one. I really prefer to use a larger (16) gauge as well. I'm gonna have to check out Spirited Earth, the components are nice. Wow Lori, both pieces are absolutely stunning! Beautiful pieces! I would be lost with out my liver of sulfur and steel wool. I really need to look into those pads you mentioned, I am so tired of all the wool shavings. 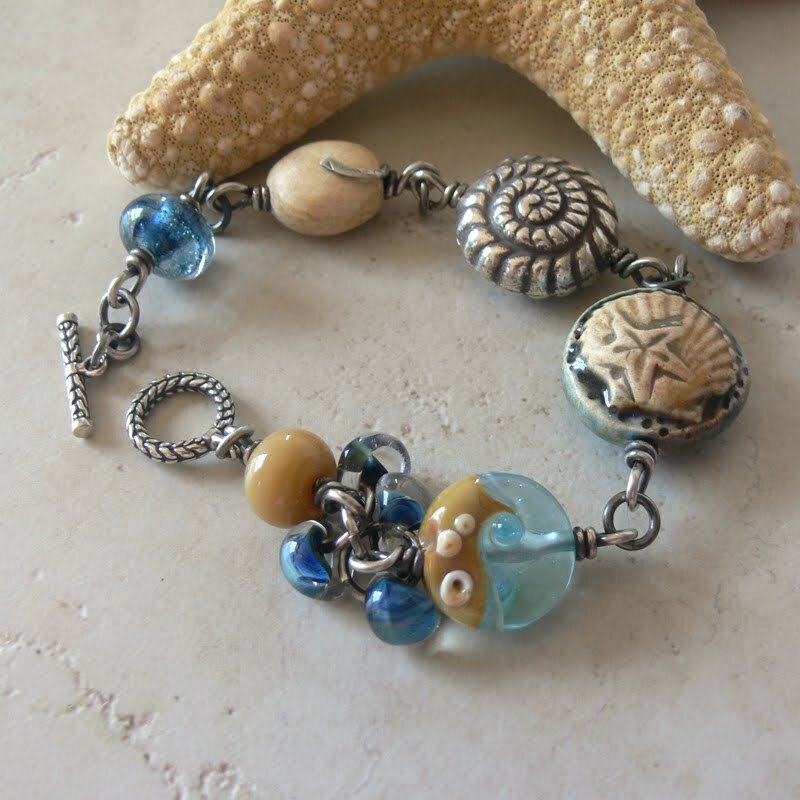 Gorgeous beads and jewelry! Wow! Both bracelets are beautiful, love the combination of colors and beads. Thank you for introducing Spirited Earth to us. Have a great week. Another great job! Love the colors! Amazing yet again. You, dear Lori, are an inspiration. Thanks for sharing. I love all of these pieces! Lovely bracelets! Nan really does make wonderful pieces! These are beautiful, lovely subtle tones. I love her ceramics! Beautiful bracelets! Both bracelets are amazing! I love the beads and the wire work! They blend so well! I hope your son is doing better, mine has night terrors so I understand how hard that is! The bracelets are wonderful. 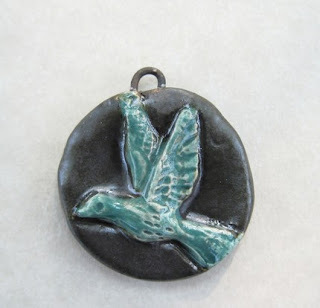 I love oxidized silver but have yet to "create" any. Love the use of heavier gauage also. Hope this week is better for both of you. Oh Lori, I think these are fantastic! really compliment her beads and pendants. 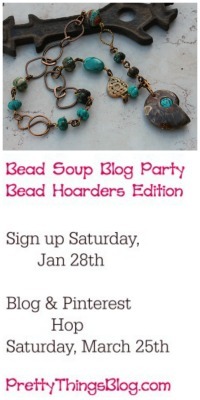 How does one send a "cup of bead soup" to you? I really hope your son is doing better. School can be a nightmare. I noticed the 16 gauge wire immediately and LOVE it. It gives such an elegant strength to your beautiful work! Hope you all feel better over there soon. I'm in love with that sea bracelet. I'm definitely giving Spirited Earth a look. Love the bracelets, especially the second beachy one! Love, love love the colors! I like what you did with Spirited Earth's fabulous ceramic beads. She was my swap partner in the recent bead swap and her beads are fantastic.